Tall, conical hat, generally yellow, serving, in conformity with the decrees of the fourth Lateran Council (1215), as a distinguishing mark for the Jews. This council ("Mansi Concilia," xxii. 1055 et seq. ; Grätz, "Gesch." 3d ed., vii. 16) decreed that every Jew should wear a distinguishing mark; this decree was reaffirmed by the Synod of Vienna, 1267. Pope Paul IV., in 1555, decreed that the Jews should wear hats of a yellow color (Grätz, l.c. ix. 339; Berliner, "Gesch. der Juden in Rom," ii. 5). 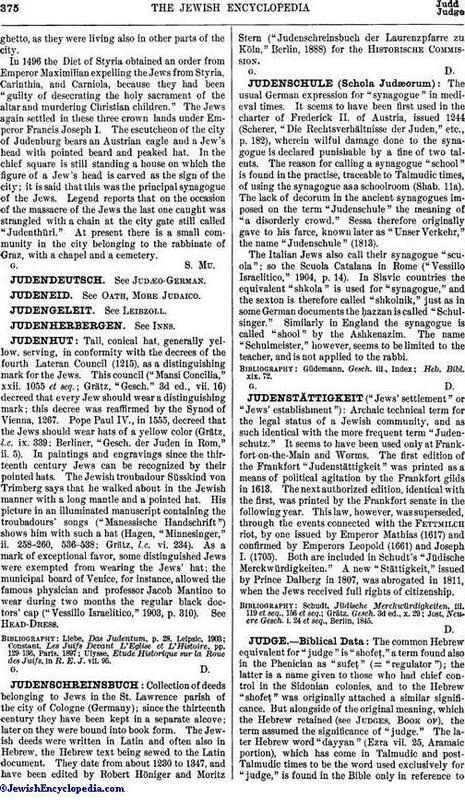 In paintings and engravings since the thirteenth century Jews can be recognized by their pointed hats. The Jewish troubadour Süsskind von Trimberg says that he walked about in the Jewish manner with a long mantle and a pointed hat. His picture in an illuminated manuscript containing the troubadours' songs ("Manessische Handschrift") shows him with such a hat (Hagen, "Minnesinger," ii. 258-260, 536-538; Grätz, l.c. vi. 234). As a mark of exceptional favor, some distinguished Jews were exempted from wearing the Jews' hat; the municipal board of Venice, for instance, allowed the famous physician and professor Jacob Mantino to wear during two months the regular black doctors' cap ("Vessillo Israelitico," 1903, p. 310). See Head-Dress. Ulysse, Etude Historique sur la Roue des Juifs, in R. E. J. vii. 95.